Richie Bennett dribbles around a Michigan defender. The freshman midfielder played 70 minutes in Saturday's contest. 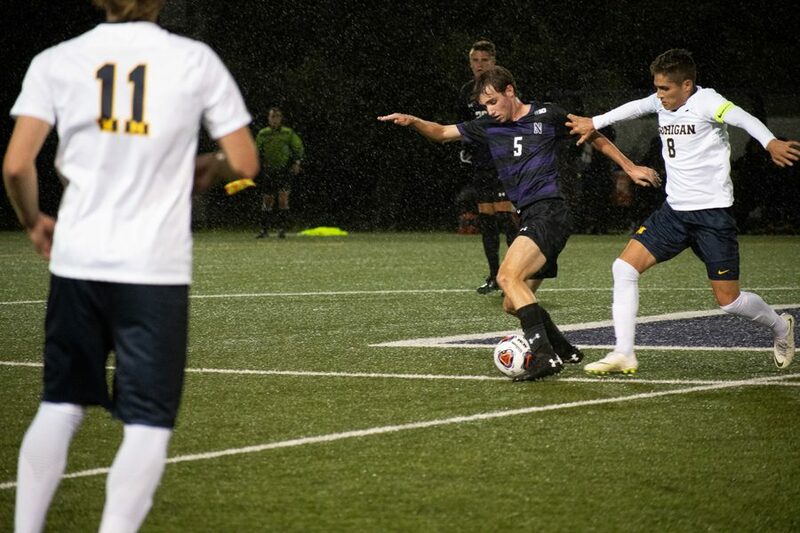 Northwestern football didn’t have any success at home on Saturday — on the football field or on the soccer pitch. As the rain fell on a cold night at Martin Stadium, Wildcats soccer fans filed in, hoping their squad could avenge the football team’s loss. Unfortunately for those NU fans, the result wasn’t any different. The Cats (4-4-2, 0-3-1 Big Ten) were thoroughly outplayed by No. 19 Michigan (7-1-1, 3-0-1) in the first half, giving up two goals in the first 34 minutes of the game and, for the first time this season, were shutout. Less than two minutes into the game, Michigan forward Jack Hallahan set up his fellow midfielder Ivo Cerda in the box. Cerda ripped a shot with his left foot that went under the legs of sophomore goalie Miha Miskovic for a quick 1-0 lead. After the goal, the Cats and the Wolverines both moved the ball into their respective thirds, but Michigan took advantage of its opportunities. Hallahan once again found one of his forward counterparts, Umar Farouk Osman, on a cross and Osman scored to add to an already disastrous first half in the 34th minute. The story of NU’s offense all season has been struggling to gain possession of the ball. It was more of same this weekend. While the Cats took one shot in the first half, Michigan was able to move the ball efficiently up the pitch and take 10. Despite the two goals, Miskovic played one of his best games this season, making multiple tough, diving saves to keep his team in the game. He finished with six, which ties his season high. In the second half, Lenahan said NU made some tactical adjustments that helped them stay in the game in the second half. The Cats opted to use three deep midfielders so that there would be more help defense on the flanks. The halftime adjustment made NU look like a completely different team. The Cats were able to possess the ball for longer stretches and keep the pressure off of their defense. The offense moved the ball into their third even more than in the first half and had plenty of chances to get back in the game, but could not convert. The Cats haven’t had to come from behind much this season. Despite the four losses, NU had only trailed in Saturday’s game and against Indiana earlier this week. Moving forward, the Cats will look to build on their second half performance on Saturday against the Wolverines. Regardless of the positive takeaways, however, Lenahan knows his team has to play better.